HIOKI Clamp On Power Meters are multi-channel power measuring devices utilizing clamp sensor input to accurately and safely measure power on single-phase to three-phase lines. 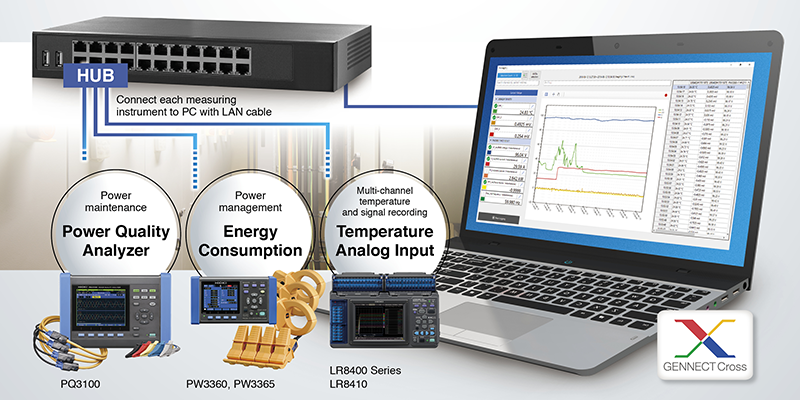 The PW3360 compact 3-Phase 4-Wire energy loggers monitor power demand and other power parameters to aid in energy audits and validate energy saving measures. The PW3360’s QUICK SET feature is an on-screen guide that walks you through the setup process, right up to starting measurement. Even if you’re unaccustomed to how clamp-on power loggers work, you’ll be able to easily configure and connect the instrument for 3-phase power measurement. In addition, by alerting you to any wiring mistakes, the device’s “wiring check” function serves to prevent measurement errors that are caused by undetected wiring mistakes. The PW3360 displays recorded measured values as a graph for convenient use in power management. In addition to instantaneous measured values, you can review maximum, minimum, and average values by moving the cursor on the demand and trend graph displays. This power logger is an essential tool for power-saving activities. Thanks to a compact design that weighs just 550 g, it’s easy to take into the field and install in confined locations. • 40 Hz to 5 kHz • Phase: 45 Hz to 5 kHz • 100A AC rated input • 1mV AC/A output • φ 15 mm (0.59 in) core dia. • 40Hz to 5kHz • Phase: 45Hz to 5kHz • 5 A AC rated input • 10 mV AC / A output • φ 15 mm (0.59 in) core dia.